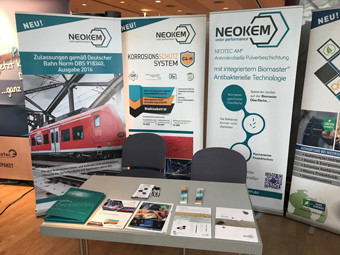 The workshop took place on the 26th and 27th of October 2017 in the congress center in Wetzlar. NEOKEM Germany was represented by Mr. Fivos Vlachakis, Managing Director Subsidiaries and Mr. Dirk Goda, Sales Manager Germany, the wide range of NEOKEM powder coatings and the new products from NEOKEM were presented. NEOKEM Germany is one of the sponsors of PIB 2017.